Fantastic Beasts and Where to Find Them is an all-new adventure returning us to the wizarding world created by J.K. Rowling. The film opens in 1926 as Newt Scamander has just completed a global excursion to find and document an extraordinary array of magical creatures. Struck in Germany by BH Mayer Mint, the very first, officially licensed Fantastic Beasts and Where to Find Them coin is a special $5 legal tender tribute to the Magical Congress of the United States of America–or MACUSA–the magical body in charge of governing the wizarding population in the United States of America. 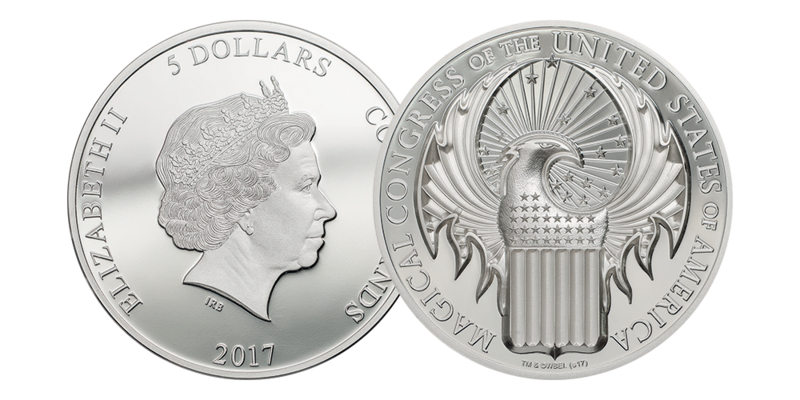 Made from 1oz of pure .999 silver, the coin features a revolutionary new minting technology that produces a strikingly high relief surface, called smartminting. Presentation box comes in full colour featuring clear top display, foil stamping, embossed surfaces and spot varnished elements. Sequentially numbered Certificate of Authenticity is printed directly on the collector’s box, making every packaged presentation completely unique. The Official MACUSA seal as featured in the new movie, Fantastic Beasts and Where to Find Them.